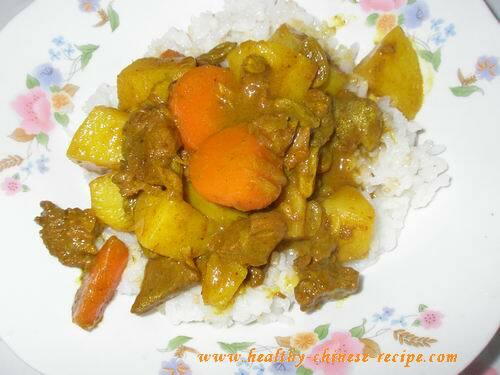 This Beef and Potato Curry combined India curry sauce in traditional Chinese Braised Beef with Potato, very strong fragrance. Adding in some raisin will not only increase the flavor but also make this dish more nutritious. Beef supplements Qi. Raisin enhances this function. 1.Wash, cut beef belly into bite size blocks. 3.Put beef in a wok, add water covering the beef. Bring to a boil. Throw away the water. Leave beef in the wok. Refill warm water covering beef. Add Sauce&Seasoning A. 4.Bring to a boil again. Then simmer for 60-90mins. It's done when the beef becomes tender, soft, and loose. 5. Take a taste before turn off heat, if you didn't marinade overnight you need add to about 1/2 teaspoon salt. Then boil over medium heat. 6. Peel, cut potato into bite size blocks. Cut carrot into same size blocks. 7. Heat oil in a wok. Add seasoning B, stir fry let fragrance comes out. 8. Add potato blocks, stir fry; Add beef blocks, stir fry. 9. Add beef soup, cover, simmer for 30mins. Add soup when it almost dry during simmer. It's not delicious to add much soup one time. Adding several times, each time not much will keep food tasty. 10. Before turn off heat, take a taste. Add a little salt if necessary. 11. Add raisin, stir fry and mix well. Turn off heat, serve. Function: Beef and raisin are good combination. They supplement Qi and blood together. Tips: Raisin is added in before turn off heat. This will keep raisin el dente. The raisin will become soft if cooked longer time. Pour some on steamed rice. 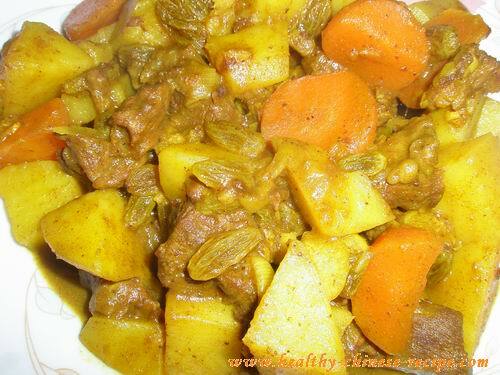 It's Rice and Curry Beef with Potatoes.